I love slow cooker meals. I love how smoothly my days “run” when I’ve got dinner going in the slow cooker. I love being able to sit on the couch through the “witching hour.” (Who am I kidding…I’m don’t sit on the couch. And just sit.) So I guess, I love being able to get through the witching hour without being in the kitchen and having little people pulling at my knees or tugging on my shirt, asking for a snack. How many times have I uttered that phrase? So this meal was a big hit…with all the little men, the big man and I really enjoyed it too. Plates were cleared, stakes were claimed on the leftovers (pulled pork sandwiches for lunch), and we all left the table with full, happy bellies. The delicious flavors, the ease of the prep and cooking…a winner indeed! Spray inside of 4 to 5-quart slow cooker with cooking spray. 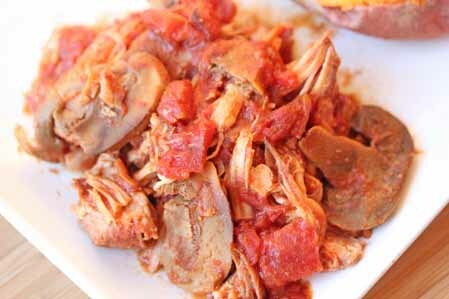 Combine remaining ingredients in slow cooker. Cover; cook on LOW 8 to 10 hours or on HIGH 4 to 6 hours or until meat is tender. Separate pork into smaller pieces. *Disclosure: This is part of a sponsored campaign on behalf of Kroger and ConAgra foods. Opinions are my own. The pork & mushrooms recipe is the one I was eyeballing. I like Kroger on Facebook. The fiesta chicken looks exactly like what my family would like. 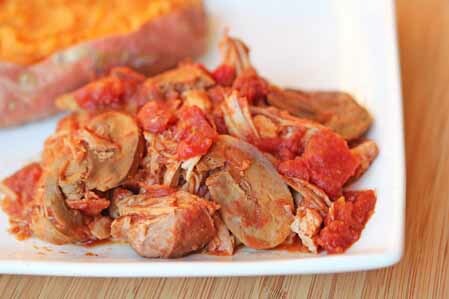 The pork and mushrooms is definitely one for me to try…anything in the crock pot is a winner! My family would LOVE the sloppy joe biscuit casserole! I like Kroger on FB! The Teriyaki Beef Bowl looks like a winner. I too think the Teriyaki Beef Bowl looks like a winner. I will definitely be trying the 15 bean cajun enchiladas. They sound YUMMY!!!! The Teriyaki Beef Bowl sounds delicious. I went to the Twitter link and selected follow, so I now follow @HurstBeans. My twitter name is CeeVegNashville.